The Origin of Wing Chun Kung Fu can be found in the turbulent, repressive Ching dynasty of over 250 years ago. At that time in Chinese history, the Shaolin Temple was a hotbed of revolutionary activity. 400 years ago when the Manchus took over China, about 90 percent of the Chinese people considered themselves to be members ofthe Han nation. The Manchus, on the other hand, came from the Northern border areas. So in order to prevent the people from overthrowing their government, the Manchus placed many restrictions on the Han. They forced the Han men to shave their foreheads and to wear pigtails so that they could be easily identified. They made the Han women bind their feet so that they became completely dependent on the men. And since the women could not walk very far, the men could not wander off. High positions in the government had to be held only by Manchus, or by Hans who had been made Manchus through a special ceremony. They even limited the number of knives that could be kept in a Han household. Outside of the government imposed restrictions, the Manchus encouraged the populace to continue with business as usual, engaging in all normal forms of cultural endeavour, including monastic pursuits. Buddhist and Taoist monks were permitted to travel and participate in religious rites virtually unencumbered by the new regime. Thus the Shaolin Temple, with its long- established tradition of martial arts training, became the obvious sanctuary for dissidents, revolutionaries, and secret societies dedicated to the overthrow of the government. Meanwhile many members of the Han officer corps who survived the collapse of the Ming dynasty re-swore their loyalties and aligned themselves with the new Manchu leadership. These professional soldiers were highly skilled in the martial arts and well-versed in the fighting tactics of the Shaolin Temple. Whenever they were sent into an area of Shaolin activity to enforce the Manchu will, they quickly put a halt to the Robin Hood operations of rebellious monks. In those days it took at least 18 years to train a full-fledged Shaolin martial artist. They had to do ten years of a hard physical style, and then eight years of internal style. During that time they also had to practice swords and spears, and various other kinds of weapons. So for the revolutionaries to train someone in Shaolin to match the skills of the Manchu soldiers, it would take 18 years … and even then they were doing basically the same thing with regard to fighting technique. They had to find a solution to this problem. So about 280 years ago, the oldest and most knowledgeable elders of the Shaolin Temple got together and decided to develop a style which would overcome all the other styles, and which would take a much shorter time to learn. Then with that purpose in mind, they met repeatedly and engaged in lengthy discussions. Each elder was the master of his own style. And each master revealed all his secrets. Eventually, they developed a theory from which they derived a set of fighting principles. The combat theory of the elders was as simple as it was profound. Since their objective was to invent a technically superior system of self defence, they began by examining the two existing types of martial arts. They noted that the hard or external styles – Shaolin, traditional chuan-fa, modern karate – committed the body’s placement well before a kick or punch impacted with its target. In this way the technique accumulated maximum momentum, and imparted maximum force. Of course the weakness of the approach was that the early commitment left the hard stylist vulnerable to an assortment of throws and perpetual unbalancing techniques. On the other hand, the soft or internal styles – tai chi chuan, pa kua, hsing-i – kept the body’s weight elusive, and committed only at the instant of impact. But the problem with this approach was that the soft stylist did not strike with enough penetration or power. The elders reasoned, then, that if they could devise techniques which landed repeatedly with both the unpredictable swiftness of a soft style and the violent penetration of a hard style, then no enemy would be able to plan an effective counter. All styles would be defeated. Consequently the monks agreed that the new fighting art should contain only those techniques which could be thrown with total commitment, halted abruptly, then instantly re-thrown from another angle with another committed technique. They called their new approach the theory of interruption. Next, since close-range techniques are both easier to interrupt and faster to learn, they determined that the new art would tend to emphasize in-fighting. Any attempts on the part of the enemy to use flashy, long-ranged movements such as high kicks and controlled swings, would be frustrated through a system of jams, straight-line hand strikes and quick, interrupted footwork patterns. The new stylist would be able to obtain favourable in-fighting distance safely, and with little effort. Finally, once the proper in-fighting range was secured, the new stylist would have to be trained to use physical contact with the enemy’s limbs to sense the enemy’s next technique spontaneously. Then both hands could be used as a team for either interrupted strikes, combined with limb traps or for simultaneous parry-and-open hand with its slaps, grabs, parries, finger pokes and palm strikes, which would be favoured over the closed fist. This process of interruption would continue with increased fury until the enemy had been vanquished. The Shaolin elders became so encouraged by the progress of their theoretical discussions that they renamed the martial arts training room in which they met “Wing Chun Hall” or “Forever Springtime” Hall. The words “Wing Chun” expressed their hopes for a renaissance in Shaolin martial arts instruction, as well as for a more effective weapon in their struggle against the Manchus. But before they could completely develop their system, someone tipped off the government and they raided the Shaolin temple. Everybody scattered. 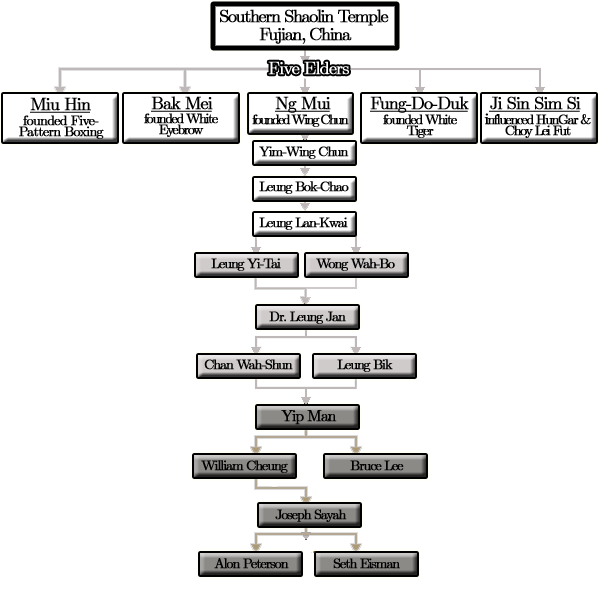 The founder of our style, the nun Ng Mui, had been one of the temple elders. She escaped the raid and hid herself in a nunnery on Tai Leung Mountain between Szechwan and Yunan provinces. She spent her time there developing the movements of the new system. When she finished she decided to call it “Wing Chun” after the Wing Chun Hall in which the Shaolin elders had held their discussions. One day when Ng Mui travelled down to the village at the bottom of the mountain, she met the daughter of bean curd vendor Yim Yee Gung. The girl and her father were in a lot of trouble because the town bully wanted to marry her. The bully was the leader of a gang and threatened to ruin Yim Yee Gung’s business, so eventually Yee Gung and the girl would have to agree. Ng Mui told them to play along with the bully, but agree to the marriage only if he could then defeat the girl in a kung fu contest. And since in those days it took several months for a marriage to take place anyway, the bully agreed. Meanwhile, the girl started learning Wing Chun with Ng Mui. Six months later, the girl stood on a five foot in diameter platform waiting to respond to the bully’s challenge. As he ascended onto the platform, he attacked with a wide roundhouse punch. The girl quickly used a Tan Sao block and palm strike, knocking him to the ground. That was the end of it. She had won! After the contest, Yim Yee Gung asked Ng Mui to take care of his daughter. So the girl followed Ng Mui to the nunnery. And then Ng Mui gave the name “Wing Chun” to the girl, since she now became the future of the art. Yim Wing Chun stayed with Ng Mui until she died. Years later, Yim Wing Chun taught the new art to her husband, a salt merchant named Leung Bok Chau. He in turn taught the art to the herbalist Leung Lan Kwai, who taught the art to a Chinese opera star named Wong Wah Bo. Wong Wah Bo then exchanged kung fu techniques with another member of his opera troupe named Leung Yee Tai. Together, Wong and Leung then added the long- pole techniques to the system. And finally, Leung Yee Tai taught the art to Dr. Leung Jan, who passed it on to Chan Wah Shun. 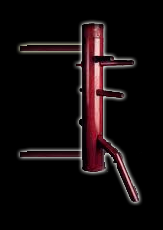 However, Dr. Leung Jan had withheld key elements of the Wing Chun system from Chan Wah Shun. Chan had been over six feet tall, whereas Dr. Leung’s two sons, Leung Chun and Leung Bik, only stood at about five feet. So in order to give his sons a slight technical edge, Dr. Leung did not teach Chan Wah Shun the proper interrupted footwork patterns. Further, he held back many techniques even from the three forms. After Dr. Leung died, the two sons and Chan Wah Shun argued over who would become the next grandmaster. Chan challenged the two sons, and because he was so much bigger, he was still able to defeat them. Chan then chased the two sons out of the Fatshan area. Yip Man became the last of Chan’s 16 disciples. Yip Man studied with Chan Wah Shun for four years, until the old master’s death. He then encountered one of Dr Leung’s sons, Leung Bik, and studied with him for two and a half years. In 1950 Yip Man started to teach Wing Chun in Hong Kong. From there, the style has spread to many parts of the world.